This magnificent home has a rather stately appearance as you approach it. 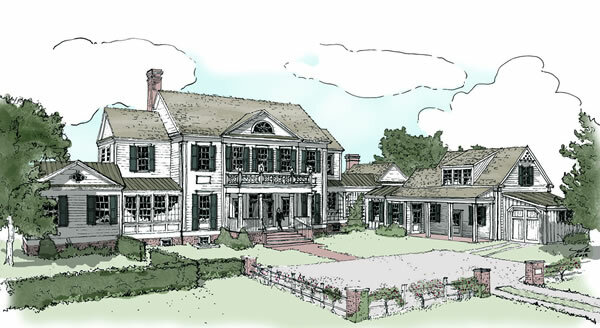 The front elevation displays an abundance of large double hung windows flanked by operable shutters, and a wide covered front porch with classical columns. As you step into the foyer – which, like all the rooms on the main level, has a dramatic 11′ ceiling – a cased opening on your right provides access to both an elevator and powder room, and across from this opening is a generous coat closet. Next to the foyer is the great room, a space that is large enough to include spacious seating and dining areas. This room has a large fireplace flanked by built–ins on one wall and on the opposite wall there’s a wide niche also flanked by built–ins. The far wall provides great views to and through an 11’–deep by 42’–wide covered rear porch – three sets of glass doors open to the porch, while a window–filled bay projects into it. A door at one end of the rear porch opens into a screened porch, a space also accessible via the office that is part of the master suite. A door at the other end opens to a sun–filled casual dining space off the kitchen. Paneled doors on either end of the dining space provide access to the kitchen. 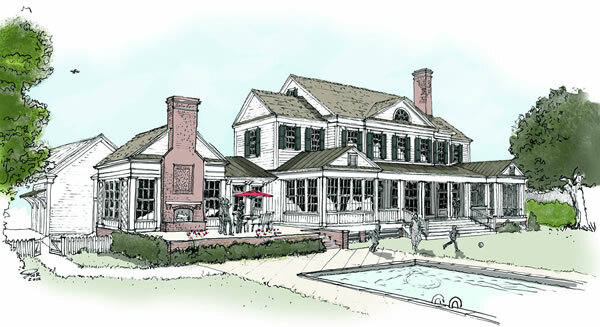 Through one set of doors you pass by a wet bar and a pair of French doors that also open to the rear porch. Through the other set of doors you encounter the staircase to the upper level on the left and a large walk–in pantry to the right. The kitchen is quite spacious, and accommodates a 48″ range, 2 dishwashers, refrigerator and freezer columns, a large center island with a vegetable sink and ample room for casual eating or serving. One wide cased opening leads to a window–wrapped breakfast room, while another leads to a large work station, a space that connects the kitchen and family room. At the work station, one wall has windows flanking a door that opens to a grill station at the rear terrace, while the other has a long built–in desk beneath a quartet of interior windows that look into a hallway. Another cased opening brings you to the spacious family room. The far wall has three large windows for light and views, and two additional windows flank a double sided fireplace that can also be enjoyed from the rear terrace. The room has a vaulted ceiling and is graced with decorative exposed beams. Cased openings off both the kitchen and the family room access a hallway with built–in storage. This leads to a multi–purpose mudroom with lockers along one wall, laundry space (one of three in the house! ), a work counter with storage cubbies below, and access to a powder room. Just beyond the mudroom there are stairs to an optional guest suite above the garage, and doors that open to either the garage or to a covered porch. Attached to the garage is a good–sized storage space with double doors facing the front of the house, and an overhead door on the opposite wall. The rest of the main level is devoted to the magnificent master suite. Double doors at the opposite end of the great room take you to either to a master hallway that leads past an office space before reaching the bedroom, or to the office directly. 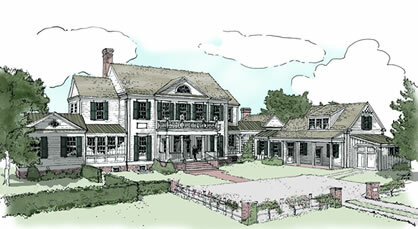 The office has 6’6″ tall windows and a pair of French doors that open to the screened porch at the rear of the house. The master bedroom is an 18’x18′ spacious room that’s filled with natural light and enjoys views from three different directions. The master bath also enjoys light and views through a wall filled with windows. Two vanities are flanked on either side by a large shower and a private water closet. There’s also a separate soaking room with a free standing tub, and two walk–in closets, one of which has a stacked washer and dryer. Both the main staircase and elevator take you to a hallway that provides access to four bedroom suites on the upper level, all with 10′ ceilings. The far wall of bedroom 1 has alternating window seats and built–in shelves, and next to them is a recessed nook with built–in cabinets. The bath features two separated sinks, a private water closet with a shower, and a large walk–in closet that has pull–down stairs that access the attic storage. Bedroom 2 has generous windows with views to the rear, and a built–in desk with shelves above it. A dressing area off the bedroom provides access to two separate walk–in closets and a bath that features two separated vanities, a shower, and water closet. Bedroom 3 also enjoys a rear view, has a built–in desk with shelves above and a generous closet. And finally, bedroom 4 has views in two directions, a walk–in closet, and a full bath. If you opt to build the guest suite over the garage, the bedroom is 12’x24′ with windows on both ends, and next it there’s a kitchenette and a full bath. 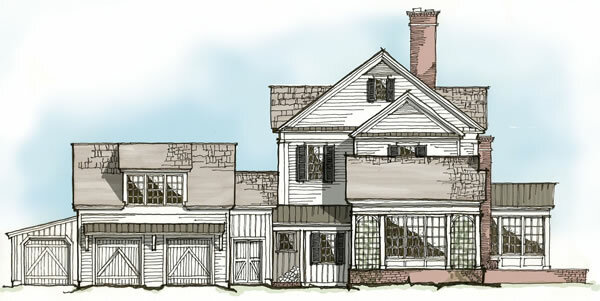 This 5,800 sq ft Neo–classical home has six bedrooms, six full baths, and two half baths. The great room serves as the central entertaining space with a formal sitting area and dining set up. The master suite is located on the first floor, and boasts two separate closets, a soaking tub room and separate shower, and a water closet. The rear of the house has a sun–bathed breakfast room, a long covered porch, a screen porch, and a rear terrace with an outdoor fireplace. Adding to the charm of the home, this plan incorporates lots of large windows, barrel and vaulted ceilings, built–ins and niches.